HootSuite is great because it's a web-based app - there's nothing to install and it's portable in the sense that you can log into your account from any computer anywhere and your customized dashboard seamlessly flows into your browser. And it has a really well done iPhone app as well. The built-in ow.ly URL shortener and basic built-in statistics are a nice value-added touch that should serve the needs of most users. 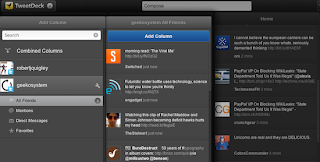 If not, HootSuite sells premium subscriptions with added features. HootSuite also supports scheduled updates - the ability to type in an update for Twitter, Facebook or other social network and have it posted at a pre-set time in the future. I love this feature and use it a fair bit. ChomeDeck has combined columns - the ability to bring in multiple account information and/or search information into a single column. So you can follow your Facebook and Twitter streams in one column rather than two (as it would be on HootSuite and most other apps), and you can have one inbox of all your replies and private messages. This is a really creative way to cut down the number of columns of content you have to follow without losing any of the actual content. 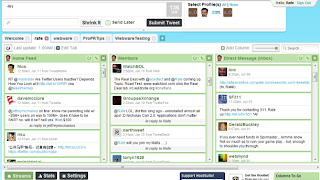 ChromeDeck (and the TweetDeck desktop app) also supports real-time Twitter streaming. Instead of the app polling Twitter every few minutes and loading two, three, or dozens of updates at once, ChromeDeck shows updates in real time automatically. This is also a great upgrade on HootSuite's Twitter updates - right now, the shortest interval you can automatically set is two minutes. In my perfect world, then, I'd have "HootDeck" - a feature-rich social media dashboard that is web-based and portable from one machine to another, did real-time streaming, combined columns, a built-in URL shortener with built-in statistical tracking, and, of course, the ability to support multiple social media accounts, which both apps do anyway. 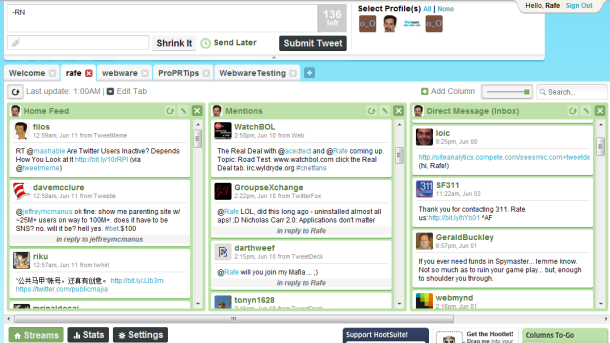 HootSuite is lacking the real-time streaming and combined columns. ChromeDeck is lacking really good URL shortening support with stats tracking, and while TweetDeck's desktop app does support scheduled updates, ChromeDeck does not. It's funny, too, because looking over this post, it's clear in my mind that HootSuite is closer to the perfect app than is ChromeDeck. Yet I find when I'm on my laptop at home and can use any platform I want, I prefer to use ChromeDeck because the combined columns and real-time streaming are just so fantastically innovative that I don't want to give them up. HootSuite is, in effect, only two killer features away from being perfect, while ChromeDeck has a long way to go. But ChromeDeck is the most forward-thinking app right now in terms of what the future of social media apps will look like. If I had any programming chops, I'd write "HootDeck" myself. In the meantime, I can only hope that ChromeDeck and HootSuite continue to steal each other's best ideas and implement them, giving all of us a better social media experience. I just switched to chromedeck for the same reasons. Scheduled updates.. that's the missing piece that is killing me right now. When I search I see references to it as a "soon to be release" feature... but nothing concrete yet. Great post! I think your statement about having a cloud-based dashboard to manage Twitter across multiple machines is a good point. 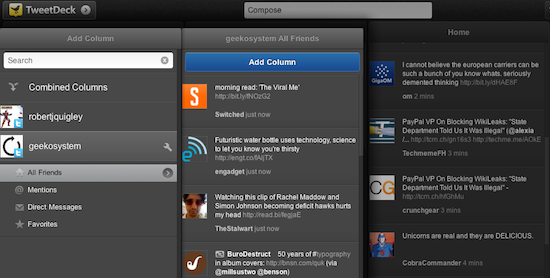 Check out HootSuite's new Publisher feature. It's really building out that scheduling power that is used so often in corporate Twitter management.